07/30/2017 – we are entering August w/ volatility AT THE ALL TIME low – ever. We also have some pretty cool eclipses coming into play. No kidding, this eclipse is going to be the first one since the inception of the United States that it only goes all the way across our country. Some serious energy is going to be hitting the continental US. 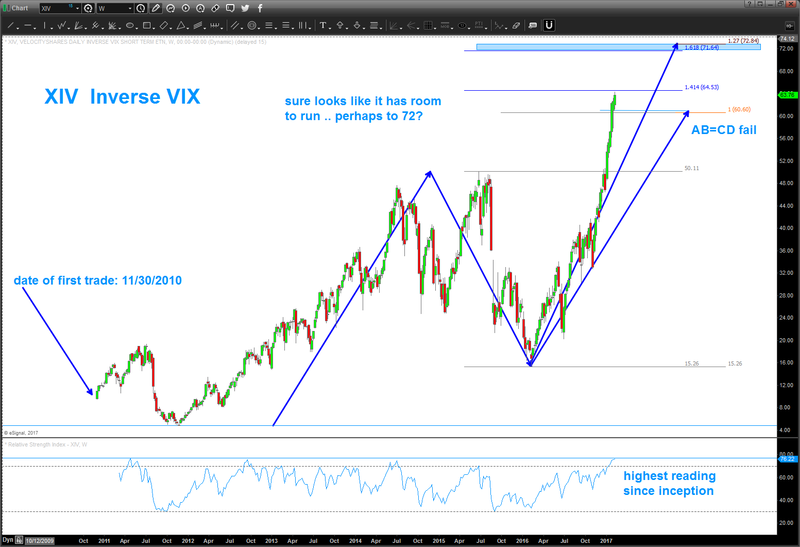 that being said, you can see we were looking at 88-90 ish as potential targets for the XIV but also noted the ‘big candle’ warranted caution for a top/resistance. we plowed thru those two targets and now have a weekly doji sitting around 93. why did it stop there? when going to targets I always like to go long term log and also use percentage projections. as you can see if we do a .618ab=cd on the percentage distance it hit the high exactly. additionally we are also hitting some long term log resistance lines – NOTE I bracketed the gap to come up w/ a zone of resistance. So, I’m still in the mindset that a correction is coming … mindful to wait for an SRC before jumping in on the LONG VIX or short XIV opportunity.